The top destinations in Greece are, not coincidentally, where you find the country’s most important archaeological sites. These ruins from antiquity, many of them UNESCO World Heritage Sites, dot the mountainous Greek mainland and several of the country's 6, 000 islands, of which 227 are inhabited. Natural scenery and cuisine are also among Greece’s top tourism offerings. Visit from late April through mid-June to enjoy pleasant weather and avoid the summer crowds. Athens, the capital, is home to the iconic Parthenon, located on the Acropolis that rises above the city. The Acropolis overlooks the Agora, the commercial and civic heart of ancient Athens, where Plato and Socrates once walked. Athens also has two of Greece's top museums: the New Acropolis Museum (theacropolismuseum.gr), which displays artifacts from the site, and the National Archaeological Museum (namuseum.gr), where you can contemplate art from antiquity recovered around the country. Not a city for the budget-conscious, Thessaloniki is northern Greece is the country's cultural capital. Deemed one of the world's "ultimate party cities" by Lonely Planet, here you will find a vibrant nightlife, trendy shops and art galleries galore. Thessaloniki also offers, according to Frommer's, the spiciest - and some of the best - cuisine in Greece. The city's Byzantine-era churches are UNESCO World Sites. 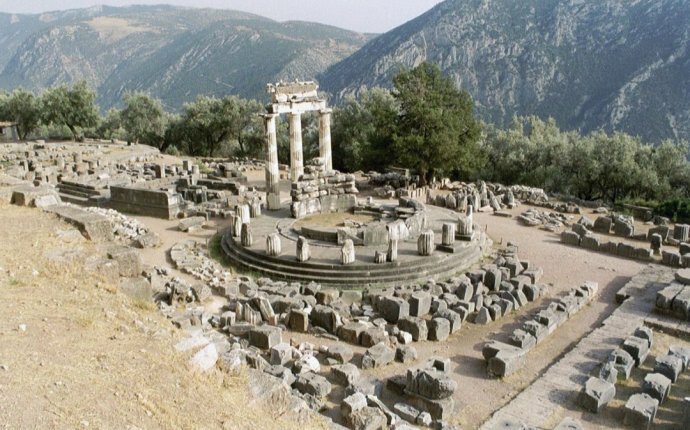 Considered the navel of the world, by the ancient Greeks, Delphi was home to the oracle of Apollo and the religious heart of the Hellenic world. The Sanctuary of Apollo is situated on the slopes of Mt. Parnassus. Here stands the Temple of Apollo, circa fourth century B.C., where the namesake god was believed to answer questions. Also worthwhile are the Delphi Museum (odysseus.culture.gr), where you can view art from antiquity dedicated to Apollo, and Sanctuary of Athena. The archaeological site in Olympia, the birthplace of the Olympic games in 776 B.C., is the most beautiful on Greece's Peloponnese peninsula, according to Frommer's. The site encompasses remnants of the stadium that hosted the contests and the Temple of Zeus, which housed one of the Seven Wonders of the Ancient World: an enormous gold and ivory statue of the king of the gods. The site's best preserved monument is the smaller and older Temple of Hera. Crete, Greece's largest island, was the site of the Minoan civilization that arose around 2500 B.C. The must-see attraction here is the labyrinth-like Palace of Knossos, built around 2000 B.C. The Archaeological Museum of Iraklion (heraklion-crete.org), in the Cretan capital contains the most important Minoan artifacts unearthed to date. You can also visit the Dhiktaion Cave, the birthplace of Zeus, according to Greek mythology. 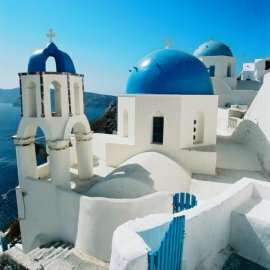 Santorini, which has made Travel + Leisure magazine's World's Best Islands list multiple times, conjures images of stark white buildings against a bright blue Aegean Sea. The island is a volcanic caldera, the result of an eruption in 1650 B.C. that ranks among the most powerful in human history. The village of Oia is a prime spot for watching sunsets over the caldera. Santorini's top archaeological attraction is the town of Akrotiri, a Minoan site believed to have been destroyed in the eruption, which is blamed for the demise of the Minoan civilization on Crete as well. Santorini also offers beaches with black and red volcanic sand and opportunities for snorkeling and scuba diving.